Spending the entire summer with my father wasn’t in my plans. I hated him. I was angry and resentful, and it made me feel out of control. Casey is carefree. She lives life to the fullest, without regrets, and to a guy like me, she was hope. We only had the summer, and I knew better than to get wrapped up with her, but I couldn’t help it. And now? Now, I don’t know how to let her go. I’d never been in love. At fifteen, my life was filled with books and family expectations. Love was not something I had time for. And then, he saved me. But when we’re together, living each day with reckless abandon, I realize that life is so much more than fairytales within the pages. I’m pretty sure he’s my soulmate. But what good can possibly come from falling so hard when you’re this young? How can this ever work? A promise. That’s all we have to hold on to. One. Simple. Promise. ***This novel contains adult/mature young adult situations. It is only suitable for ages 17+ due to language and sexual situations. 4.0 out of 5 starsMiss Lum's debut novel.......Young love, beautiful, happy, sad, all of it heartfelt. Congratulation's J Lum on your debut Novella!!! It was well written and the formatting was just beautiful, something you don't see in many books. I loved Toby and Casey's story. Toby has had a tough upbringing, dealing with things no kid ever should but sadly do and Casey having to deal with her 'father's expectations', It was well paced, not too fast, not too slow, just right. It had me in tears, it had me laughing, it had me feeling. I can't wait to see how their adult life turns out. 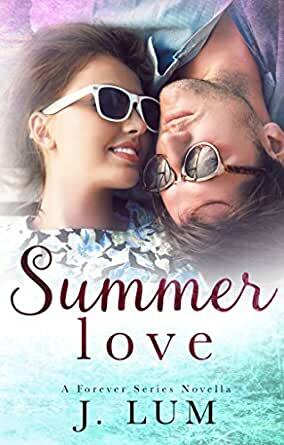 This is the debut novel for J. Lum and she has bright future ahead of her if Summer Love is an indication of her storytelling ability. This is really a novella that introduces us to Toby and Casey two somewhat rebellious angry teenagers spending their summer at their respective family beach homes. Let's face it I think we all had cause to be rebellious in our teens but these two really have pressures facing them that none of us want to experience. Ms. Lum does a wonderful job of developing her characters and the story itself. I felt all of Casey's joy, tears and anger at what's expected of her. And Toby he's so lost in what he thinks he knows and he lets those feelings fly at the risk of losing the best thing that's ever happened to him. The pace is perfect for a Summer spent at the beach and we also get some great secondary characters that I'm so going to get to know in this series. And the ending? Wow!! Totally threw me for a loop and I even had my mouth hanging open because how could the author leave us with that little gem? I know when we get Forever Love it's going to have been worth it because I'm positive it'll be worth it when we again get to see Toby and Casey! 5.0 out of 5 starsAmazing Debut! J. Lum knocked it out of the park with this debut novel. She hit all the feels with this one. I connected with Tobias "Toby" and Casey right away. The story was compelling, and I found myself completely enthralled with how the characters developed. Don't let the YA genre of this book fool you into believing that there is no depth to the emotions in their story. I felt every emotion that they were feeling, frustration, loneliness, longing, confusion and heartbreak. The story ends with a "to be continued" and I cannot wait to see where Ms. Lum will take us in the next phase of their lives. 5.0 out of 5 starsWonderful Debut!! This is a one-click you don't want to pass up!! While it's only a novella, we get the backstory on Toby and Casey. Two teenagers who happen to meet one summer while staying in NC. Casey with her family and Toby with his dad and his new family. While Casey is sunshine and light, Toby is the exact opportunity. We learn about their family life and it's not all pretty for Toby. It shows us why he is the way he is. With the help of Casey, Toby is able to change and let go. It's a summer about lessons in first love, forgiveness, understanding, patience and second chances. I definitely felt the emotions and am eagerly waiting for the next book to see how it ends! 5.0 out of 5 starsOne click!!! Summer Love...Where to start?!? This is a pre-novella of two teens who fall in love one summer and are learning about themselves in the process. This is Young Adult which leads into their story as adults which I CANNOT await to read!!!! This book will give you all the feels. This is a debut book for the author and you wouldn't even know it by reading! I highly recommend one clicking!!! Athour J Lum hit the ground running with this debut book. It’s a story of not just young love but life, love, family, and all the hard stuff in between. The 2 main characters are teenagers but are written with such emotion and passion I couldn’t help getting lost in the story. I laughed, I fell in love, I cried tears, and was left in the edge of my seat. It is a cliffhanger but thankful Forever Love is our now!